It was a beautiful day in Evansville, IN for a wedding. Autumn and Luke have been doing a countdown on social media for a good month and when I saw them Saturday it was impossible not to notice their excitement. The wedding was at the fairgrounds and we snuck away to a near by town, Newburg, which is right on the river to take some more photos. The shady trees and water were just perfect. 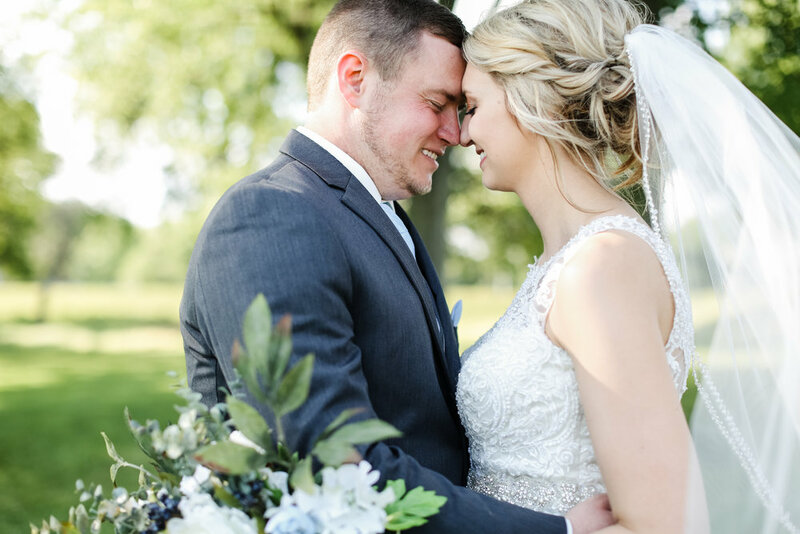 My favorite part of their day was when Autumn and Luke read their vows during the first look. How romantic is that?! It was an even more intimate moment before all the crazy and I think it should become a thing! Luke lost his dad unexpectedly recently and Autumn made sure he was still a big part of their day. She had a special locket of him on her bouquet and even included him in her vows to Luke. What a beautiful bride inside and out. HIS Answer: I had been staying at my cousins Taylors apartment for her sister Bretta’s 21st birthday and I was sitting on the couch watching a college football game (surprise, surprise) the door bell rings and before I can get up to answer it a beautiful women walks in and says is Taylor here. I was caught off guard by how gorgeous she was and before I answer Taylor called for her from her room. After Autumn left I asked Taylor who her beautiful friend was she told me her name was Autumn and that she was dating someone. Taylor later introduced us at the salon and I remember calling my cousin Carson and telling him I had met the most amazing woman and that we were meant to be. HER Answer: Luke’s’ cousin Miss Taylor Waggoner introduced us, she just so happened to be one of my coworkers at the time but also one of my very good friends and still is. We first met at her sister Bretta’s 21st birthday. I had stopped by Taylor and Bretta’s apartment to wish her a happy birthday and to have a great night out, and Luke and I got introduced for not even 5 minutes when I was leaving. We then met again 6 months later and have been together ever since!! 2. What is your favorite date night? HIS Answer: First we would make a steak dinner and potatoes the we would cuddle up on the couch with a glass of wine, cold beer and watch Illini Football game. HER Answer: Staying in and making dinner together then playing Mario Party, or watching movies. We are reading our vows to eachother at our first look instead of at the ceremony because we want it to be just between the two of us. Enjoy Mr. and Mrs. Carmody! Autumn and Luke you were a dream couple to work with, Congratulations! I hope you are having an amazing time honeymooning in Jamaica!